Mish's Global Economic Trend Analysis: Household Spending Projections Decline Again: Does the Fed Believe Its Own Surveys? 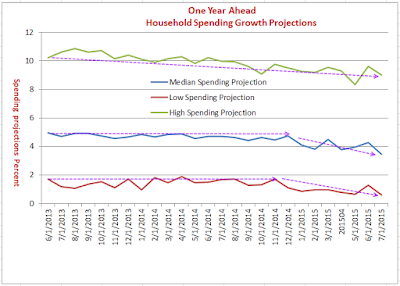 Household Spending Projections Decline Again: Does the Fed Believe Its Own Surveys? Economists in general, but especially those at the Fed, continue to state a belief that the current economic weakness is transitory. And the near-universal economic forecasts predict increases in consumer spending due to wage increases and low gasoline prices. However, if you ask consumers what they believe they will spend, that answer is in sharp contrast to what economists expect. 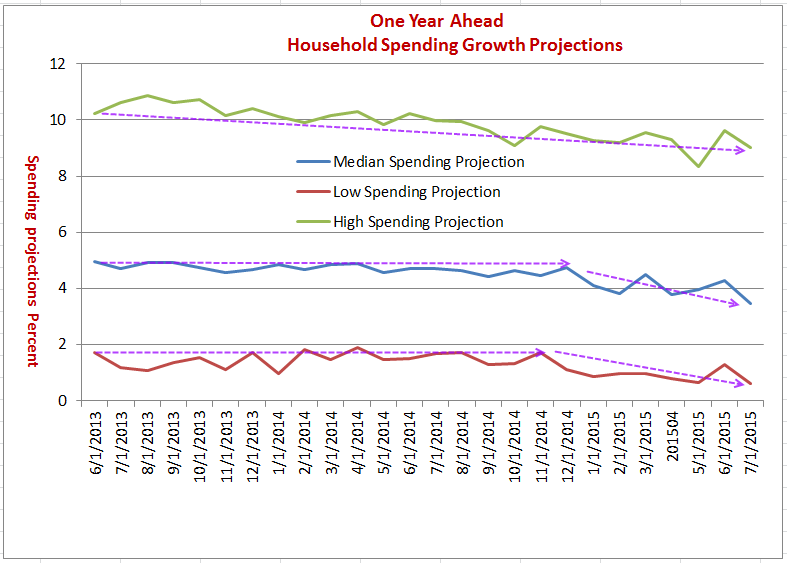 As I did in May, I downloaded household spending projections from New York Fed’s Survey of Consumer Expectations. Here is a chart from the downloaded data. Let's take a look. Consumers at the low end of projection (those living paycheck to paycheck, forecast a mere 0.62% increase in their spending, down from 1.28% last month. The median forecast is 3.46%, down from 4.29% last month. The high end forecast is 9.01%, down from 9.62% last month. The absolute numbers are not that important because month-to-month numbers swing a bit. Yet, it's easy to see a change starting late last year in the median and low projections. The high end projections have been in decline for even longer. These trends are very recessionary looking, but the Fed does not believe its own surveys.